Aquaponics is a recirculating water system where, in controlled tanks fish are raised and the water from the fish is then funnelled to planting beds where the plants grow with just water and no soil. The system at the BRC grounds has been successful in raising tilapia and various local edible and medicinal plants. It uses rainwater harvesting and it comes in no contact with any natural water system. This succeeds in keeping the fish extra healthy and not affecting any local wetlands. If you have seeds from local food crops that you would like us to test in this facility please bring some by to the station. No imported seeds , no GMO's please. We will also be experimenting with producing fish food. from island based resources. We do have limited amounts of fish and plants for sale. Please inquire on availability. Barbuda was experiencing drought during March and April 2014. With very little water the aquaponics facility was still able to produce lettuce and other greens for the local market. 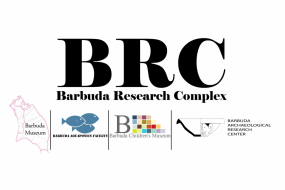 We keep refining and adjusting the system for the climatic conditions of Barbuda. We will post the protocols after the first year of experiments. Feel free to contact us if you have any questions regarding product, produce, process or facility.